At Photocamp Utah 2010 I presented a workshop demonstrating high-speed photography. As promised, here are my notes (pdf). The video from my presentation can be seen here; the first little bit was taken during setup so it takes a bit before it really gets into the presentation itself. All the videos can be seen here. I was asked a couple questions afterward and thought I'd share them to help clarify what I talked about. If there are other questions, please leave a comment and I'll update this post. For the first setup, any camera that has continuous fire mode and a means of firing a flash will work. Typically this means something with a hotshoe connector on it. For the second setup, any camera that can be set to a long enough shutter speed to allow you to trip the shutter and then cause the event will work. Since the trigger fires the light which causes the exposure, you just need to be able to have the shutter open when the light goes off. 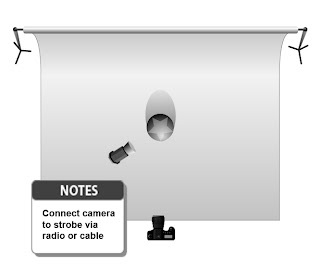 For the third setup, the camera needs to have a remote shutter release connection. Can I use the built-in flash? This will only work for setups one and three and depends on the model of your camera and how much control you have over the flash. My camera does not have a power adjustment for the built-in flash so it won't keep up with drive mode. I think some cameras do have the ability to adjust the power and so they may work. Will any battery powered flash work? The key is to have one that has multiple power settings; the lower the power setting the better. I have an older flash that I've used for relatively slow things that works acceptably with it's lowest setting of 1/16th power. It probably would be too slow for things faster, like BBs or bullets. 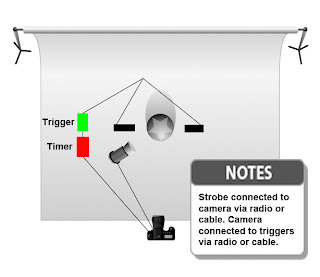 Regarding setup three, how do I connect the triggers to the camera? I had a cable that connected the trigger to the shutter release. This will probably involve a custom cable. This was easily done with my camera model since the shutter release plug is a standard size commonly used in audio applications. Some models of cameras have a plug unique to that camera manufacturer. In these cases, you may have to buy a shutter release button and cut the end off to connect the wires to the trigger. 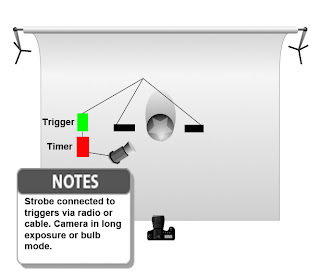 There are also setups where you could use a radio to connect the trigger to the camera. This will require cables to connect the trigger to the radio transmitter. (This is the same as for setup two.) And you'll also need a cable to connect the receiver to the camera's remote shutter release. What this looks like is highly dependent on the radio and camera models. Diagram templates courtesy Kevin Kertz. In no particular order, here are some other Photocamp Utah wrap-up blog articles. If there are others, let me know about them and I'll add them to the list. Pat Wright wrote about volunteering and community. Mike Tittel wrote about the Business of Photography panel. Ann Torrence recapped the event in general. Nathan Marx recalls his thoughts on Zack Arias' closing keynote. Nicole related her Photocamp experience with raising her children. Alicia D reminds us of Zack's Transform video that brought him to our attention. Ryan makes some observations about the volunteers. Dav.d shares an HDR tutorial based on his presentation. Torsten Bangerter learned you have to have a goatee to be successful as a full-time photographer. Parker Grimes gives us his perspective as someone who had to drive four hours to get here. Nicole Young thanks the key players that made this a success. Quinn gives us a refresher on the high points of the opening and closing keynotes.